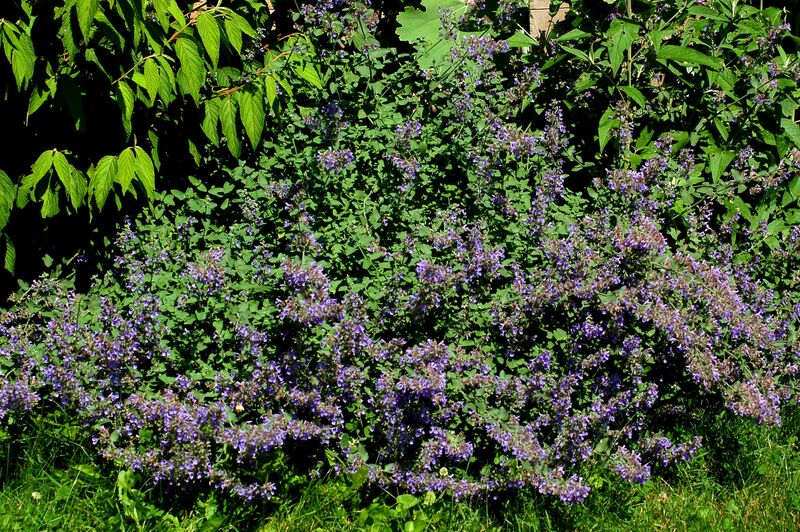 By contrast, catnip has a rather weedy appearance and is rarely grown as an ornamental. Nonetheless, it is king of the catmint plants because of its effect on that diminutive "king of the jungle." Nepeta x faassenii '6 Hills Giant' is a showy herb, because of its size and the number of flowers it bears. Shear back this long-blooming perennial after its initial blooming, and you will be rewarded with floral color for most of the growing season. Since it is a drought-tolerant ground cover, this is about the only summer care it requires. A common landscaping mistake for first-timers with 6 Hills Giant is the failure to give it enough room. The herb will end up dwarfing any smaller specimens installed around it. This catmint plant should be sent out to play with the big boys lest it bully the little ones. Likewise, if you are going to use it as an edging plant for a walkway, do not plant it too near the edge of your path, else it will spill over and impede traffic. Similarly, you can let it fill in that gaping hole you have in the front row of a flower bed, but be sure to set it back three feet or so. Otherwise, it will hurdle over landscape timber edging (or whatever type you use) and become a nuisance when you have to mow or weed whack. However, properly situated at the front of a perennial bed, it can serve as foreground for taller plants such as hollyhocks and still hold its own. 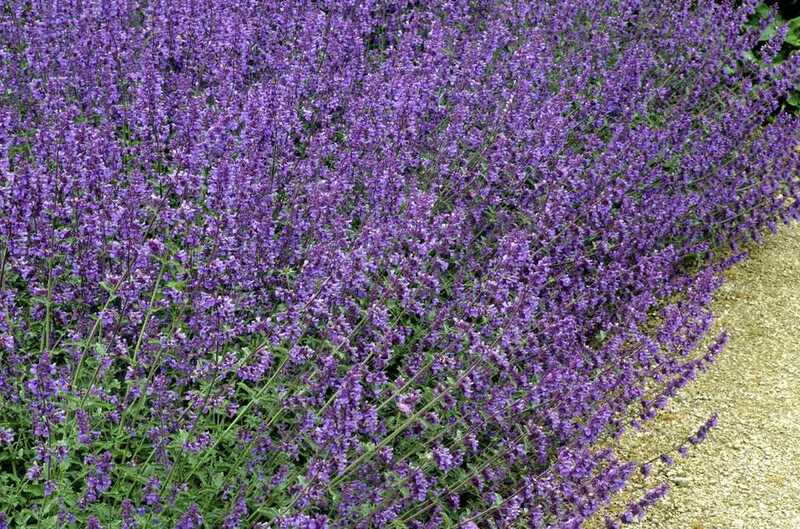 Names can be deceiving sometimes, but in the case of 'Six Hills Giant' and 'Little Titch', the cultivar names clearly suggest how these two very different varieties of catmint plant might be used. While 6 Hills Giant can play with the big boys, Little Titch is easily overwhelmed. It is just as tough (drought-tolerant) and just as long-blooming as its bigger cousin, but choose petite friends for it if you really want to show it off. A prominent nook in a rock garden might be just the spot for this dwarf catmint plant. So might any landscape plagued by deer, as Little Titch (indeed, most types of catmint) is a deer-resistant perennial. This is the catmint plant you have been waiting to hear about if you are a cat-lover. Catnip (Nepeta cataria) drives many cats wild. Other members of the genus may also produce an effect on some cats, but you are best off sticking with catnip if your main purpose is to grow an intoxicant for your cat. Humans have put catnip to various medicinal uses for themselves, too. That's right, catnip is not just for cats. Ever heard of "catnip tea"? It makes a good choice if you want a relaxing blend in a tea. You can also draw wildlife to your landscaping by growing catnip (or many of the other types of catmint plants), including butterflies. Washington State University reports that catnip draws hummingbirds. It also attracts bumblebees. Luckily, it does not draw unwanted deer pests.